This week, refurbished Apple Watch Series 3 with LTE models became available in the U.S. for the first time — but they’re going fast. Apple added the Certified Refurbished S3 models to its online store over the past couple of days. While there were initially 10 variants available for sale, there’s now only one model currently in stock (as of the writing of this article). The refurbished Apple Watch S3 devices are priced from $359 to $549, depending on size, case material, and other factors. That’s about 15 percent off the standard retail price. 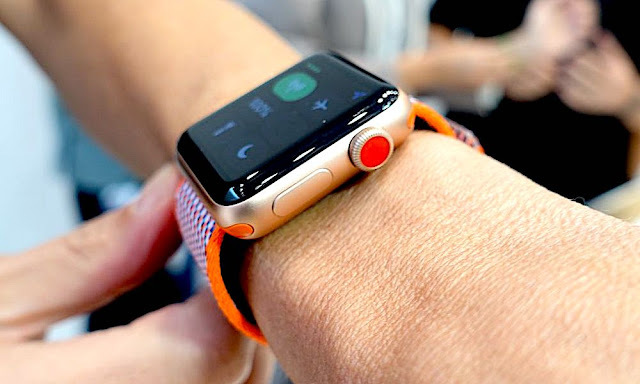 For example, the in-stock model, a cellular-equipped Apple Watch S3 with a stainless steel case and a black sport band, is currently going for $549. That’s about $100 off the standard price point. As with its other Certified Refurbished products, the Apple Watch Series 3 wearables are thoroughly inspected, cleaned and tested before being put up for sale. They’re also completely repackaged with the standard manuals and accessories, including a brand-new cable and charging puck. In other words, you’d be hard-pressed to tell the difference between a refurbished Apple Watch and a brand new one. The refurbished Apple Watches come with the company’s standard one-year warranty — which kicks in on the date of delivery. You can also buy an extended AppleCare+ warranty, which lasts for an extra year, for an additional $49 in the U.S. While there’s only one model available currently, additional stock is likely to be added in the future. If you have your heart set on a particular Apple Watch Series 3, you can check available models using the Refurb Tracker website. The Apple Watch Series 3 first debuted last September. In addition to LTE capabilities, the wearables also featured a faster processor and a much more efficient wireless chip. Refurbished Apple Watch Series 3 models have been around for some time. But, until this week, Apple did not make any cellular-enabled models available for sale.